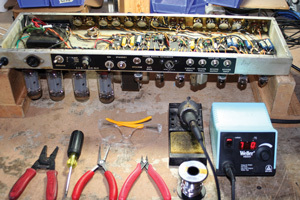 One of the easiest and least expensive ways to personalise your amp is to customise it with modifications (mods). Browse our favourite mods using the “Modifications” menu above. We’re regularly asked to mod amps and to tweak them so that they become more suitable for that person’s tastes. Where possible we will retain the structural integrity of your amp so that it can be fully reversed should you wish to remove it at a later stage.